Through the third to sixth centuries, great Christian men and women colonized the deserts of Palestine, Syria and Egypt, shaping the church through their examples of faith and devotion. History now knows them as the Desert Fathers and Mothers and their lives display an unswerving commitment to the love of Christ sorely needed in today?s world. Bradley Nassif tells the story of how the deserts of the Holy Land forged a holy people and a lasting legacy of faith. As part of the Ancient Context, Ancient Faith series, Middle Eastern lands, culture and history directly undergird this exploration of ancient spirituality. Surveying the lives of Anthony of Egypt, Pachomius, Melania and others, Nassif demonstrates how the wilderness experiences chronicled in Scripture guided the practice of Christian faith in biblical lands. 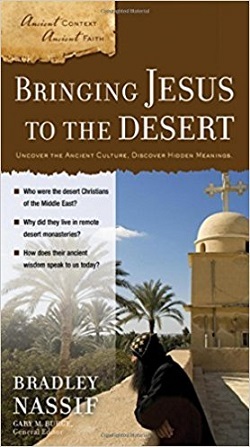 Bringing Jesus to the Desert can help pastors, Bible students and lay learners trace God?s work in the past and draw on the power of God in the desert places of their own lives.